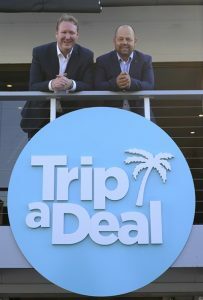 Travellers Choice has entered into a ground-breaking partnership with TripADeal that will see its members serve as fulfilment partners for the award-winning online travel agency and receive exclusive access to a range of unique TripADeal-curated travel packages. Based in Byron Bay, on the New South Wales north coast, TripADeal creates competitively-priced, bucket list travel packages, which it promotes aggressively through national digital and print channels. Since its launch in 2011, the company has firmly established itself as one of the country’s leading online travel agents – as acknowledged this year when it was named ‘Best Online Travel Agency’ at the AFTA National Travel Industry Awards. TripADeal’s rapid expansion was also recognised when it topped The Australian Financial Review‘s list of Australia’s 100 fastest growing companies for 2016. Under the new preferred arrangement, consumers can choose to book and pay for a TripADeal package through any Travellers Choice store, with the group’s members receiving commission for each booking. In addition, TripADeal will develop bespoke packages to key destinations exclusively for sale through Travellers Choice members. Travellers Choice Managing Director Christian Hunter says the new partnership with TripADeal represents a pioneering convergence of offline and online distribution channels. “Travellers Choice and TripADeal are creating a new business model in which offline and online enterprises combine their respective strengths to generate new business rather than continually competing to shift customers from one channel to another,” says Hunter. TripADeal Chief Executive Officer Norm Black says the decision to work with Travellers Choice came in direct response to customer feedback. “Some people want to take advantage of the attractive cost savings and inclusions our packages offer, but still prefer to book face-to-face through a traditional retailer,” says Black. The new preferred arrangement will be piloted with a select group of Travellers Choice members on 25 September 2017, with a group-wide launch going live on 9 October 2017.